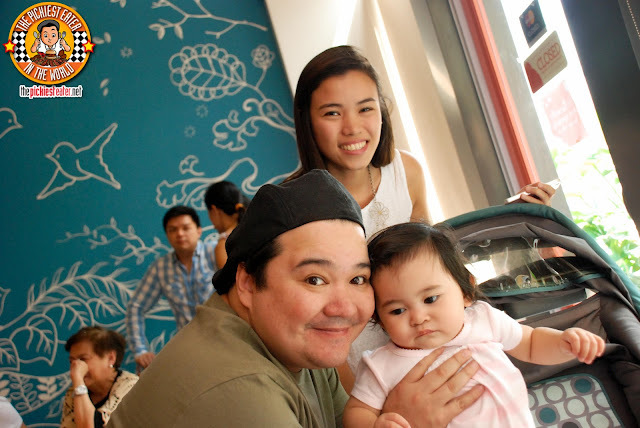 THE PICKIEST EATER IN THE WORLD: EARLY BIRD BREAKFAST CLUB GIVEAWAY! Walking through the doors, you get the feeling that the very essence that Early Bird Breakfast Club wants to invoke, is that you your mornings should start off with a smile, as in will carry you throughout your entire day. 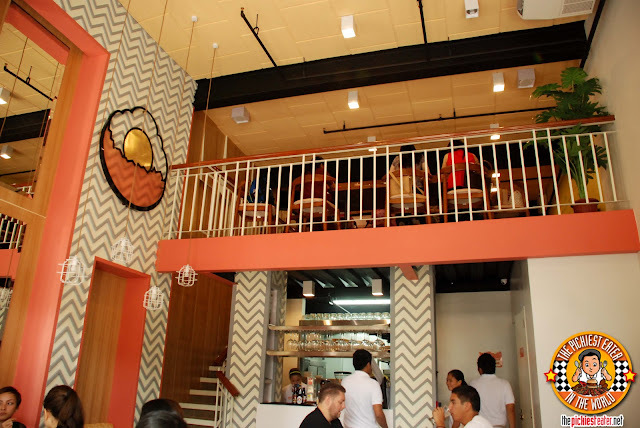 From the vibrant colors on the walls, to the warm smiles of the Staff, and the savory smell of cooked meats swirling through the air, no matter how foul your mood may be it's virtually impossible to go there without feeling a smile slowly breaking out. 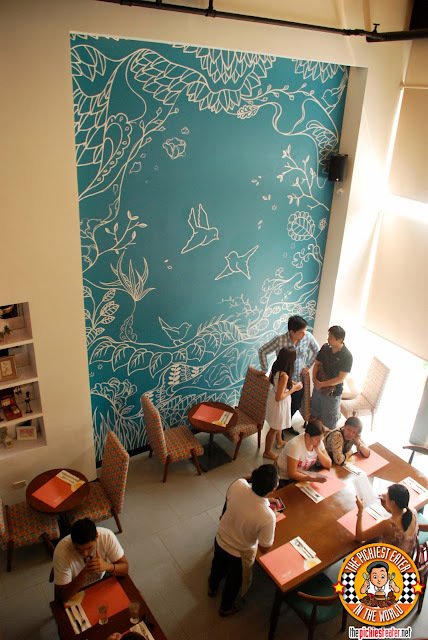 Adorned on the side wall, is a stunning floor to ceiling mural that's extremely soothing on the eyes.. There is a certain tranquility to it, that makes you think you could spend the entire day here with a good book or to sit down and write. 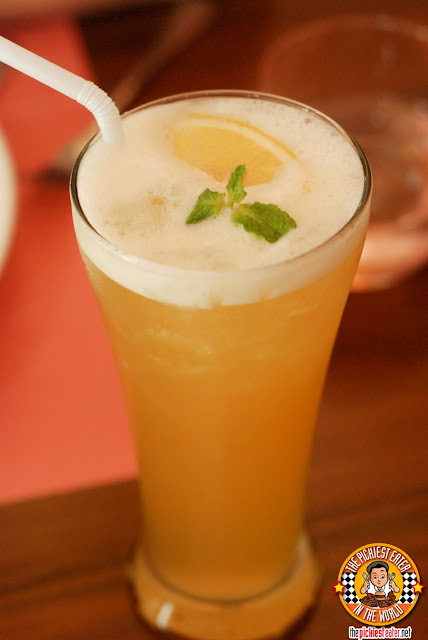 Rina loved the Early Bird Signature Iced Tea (P125). She's a fan of drinks that don't have strong flavors.. Subtle enough to tickle the taste buds without being overwhelming at the same time. It had a nice hint of citrus that complimented its natural sweetness. As soon as I found out from my blogger friend/idol (nax) TalesfromTheTummy that The Early Bird Breakfast Club had Bacon Twists (285), (Something that they didn't have yet during my first visit), I dropped everything I was doing and sped off to The Fort (My boss was wondering where I went in the middle of our meeting. Oh well.). In theory, this was a fantastic idea. But execution wise, I think it still needed a little bit more work. 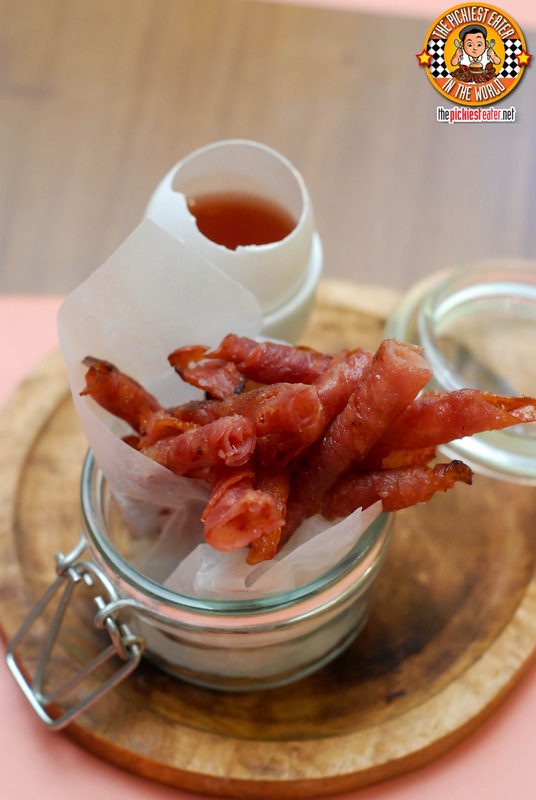 Think about it: Rolled up strips of baked Bacon, with a side of Vermont Maple Syrup as a dip.. What's not to like? The flavor of the bacon was delicious, as bacon tends to be. However I did notice that it was extremely leaner than I had liked it to have been. But that's fine, it was still bacon, so by default it was yummy. The problem was that it was a little but too chewy for my liking (What's English for "Makunat"?). I think if I got this fresher, it would have made a world of a difference. 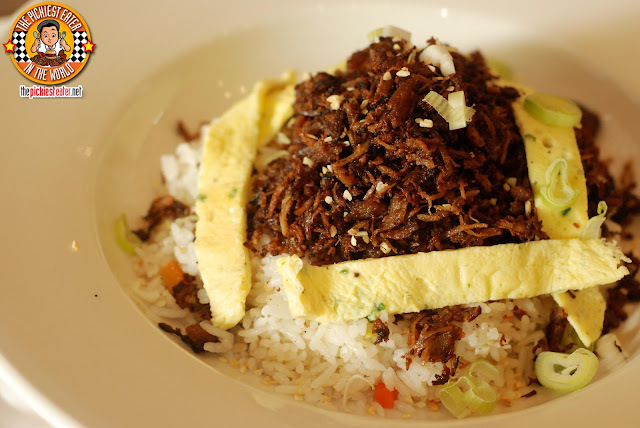 Something that caught my attention was the Adobo Sunrise (P315), which is their version of Adobo Flakes, topped over Early Bird's Breakfast Rice, surrounded by omelet strips. There wasn't anything about this dish that I didn't love. First off, the Breakfast Rice: I loved it. It's sort of like a breakfast yang chow, that has just the right amount of flavor that won't overpower the main dish, but compliment it fully. 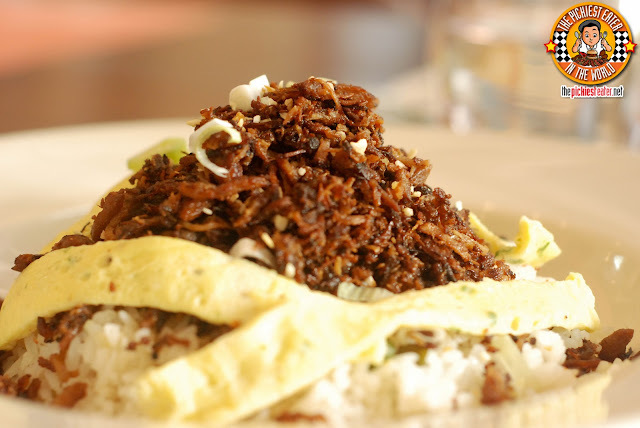 Secondly, the Adobo Flakes. I loved it. They didn't give me a "serving" of Adobo Flakes as much as they did a pile so high, that it required mountaineering skills to scale. It was toasted perfectly, so that it doesn't taste like it was burnt, as some Adobo Flakes tend to do. It had the right amount of acid from the vinegar on it, letting the flavor of the meat become the primary attraction of the dish. I love dishes wherein all I need is one spoon to eat it, and after mashing up all the flakes into the rice, this was the epitome of "comfort food". Rina has a fondness for Risotto, so it was pretty much a given that she'd be ordering the Chorizo and Mushroom Risotto (P465). The contrasting flavors of creaminess and acid work together nicely, to create an extremely filling dish. The Chorizo was the real deal. 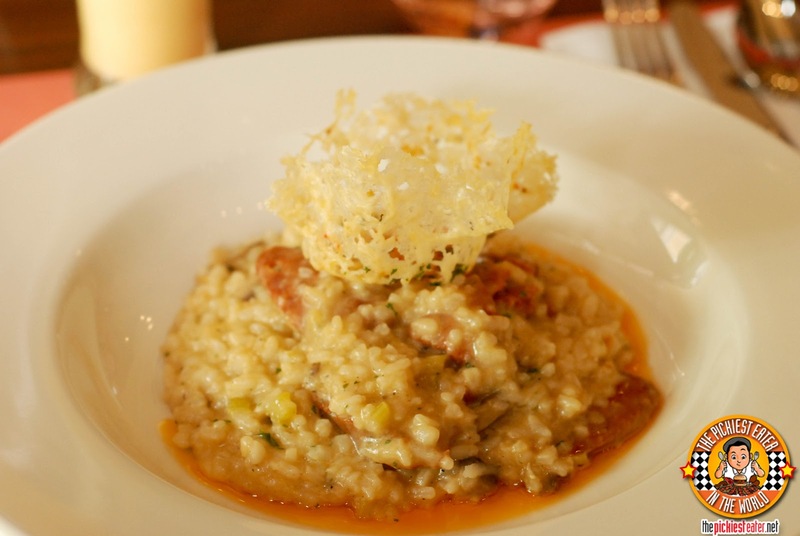 The thin slices were packed with flavor that coated the risotto, giving it a tangy punch. The dish was topped off with a Parmigiano Reggiano, giving it another level of flavor. When you're at Early Bird Breakfast Club, you might not want to miss out on their Signature pancakes. The Early Bird Signature Pancakes (P325) is a short stack of fluffy pancakes drizzled with a generous drizzling of Chocolate syrup, and powdered sugar. On the side are some unique fruit infused cream butters that works perfectly with the Vermont Maple Syrup. Another sweet treat that you should try is the French Toast Fondue (P215). 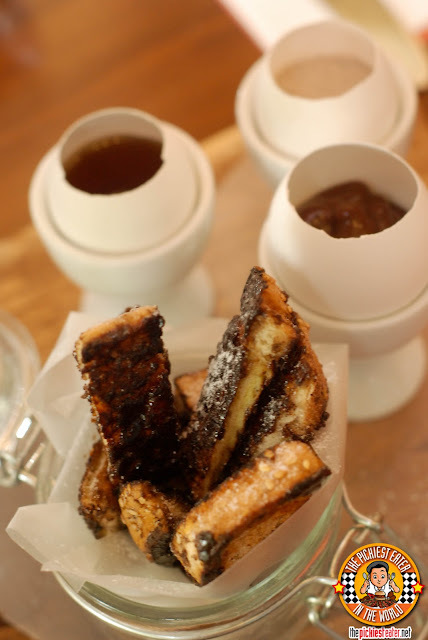 Tasty Strips of French Toast, served with three different types of dips.. Chocolate, Cinnamon and Maple Syrup. (My favorite is the cinnamon). It's absolutely delicious! The people behind Early Bird Breakfast Club know what the most important meal of the day is all about. 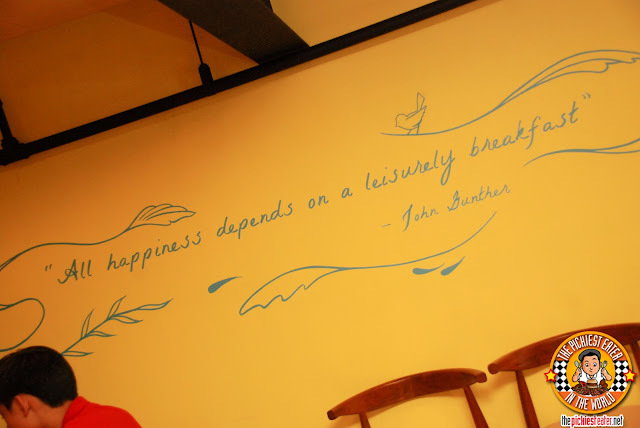 With all the hype IHOP is getting for its breakfast fare, this nice little nook at The Fort must not be overlooked. Baby Rain and I even got to meet the lovely owner, Ellen, who generously donated some GC's for a little giveaway from EARLY BIRD BREAKFAST CLUB! Get a chance to win Gift Certificates for an order of their Signature Pancakes and two orders of French Toast Fondue! The Early Bird Full English looks sublime. Anything pancakes also makes my mouth salivate. 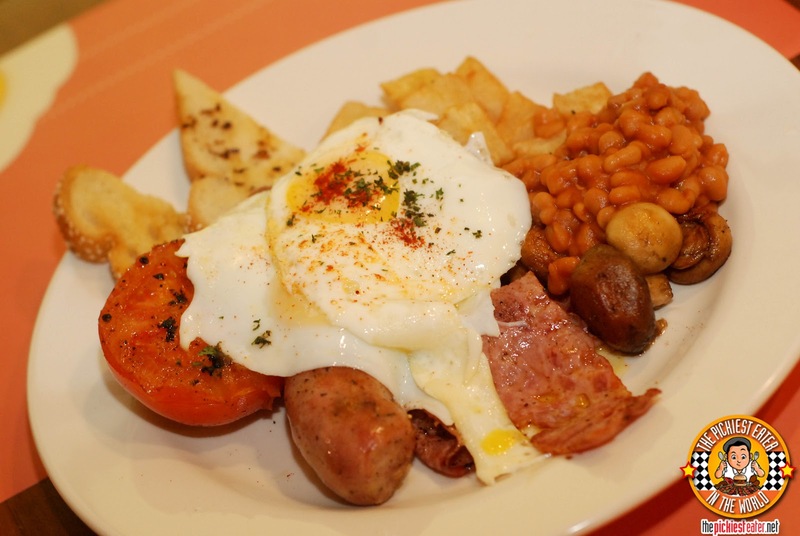 What dish are you excited to try from Early Bird Breakfast Club? The Early Bird Full English looks so yummy! I will be honest, I already ate here around 3 times already because it was just that awesome. Anyway, I would like to try their eggs benedict and maybe their choco banana berry french toast. I'm excited to try their French Toast Fondue! I Like to try their Adobo Sunrise. I will have Lemon Butter Bangus, Viva Longganisa, Choco Banana Berry French Toast please. Oh, and Nutella Hot Chocolate, too. The dishes are so yummy! I would love to try the Signature Pancakes paired with Nutella Hot Chocolate. How's that for sweetness? early bird signature PANCAKES and the adobo flakes! I would love to try the Peanut Butter and Caramel French Toast. I would likt to try the Bacon Twsists! I'm curious how it would taste with the Vermont Maple Syrup... it sounds so delicious! I'm also a bacon fan here! Great we have more breakfast places now! French Toast and the pancakes! 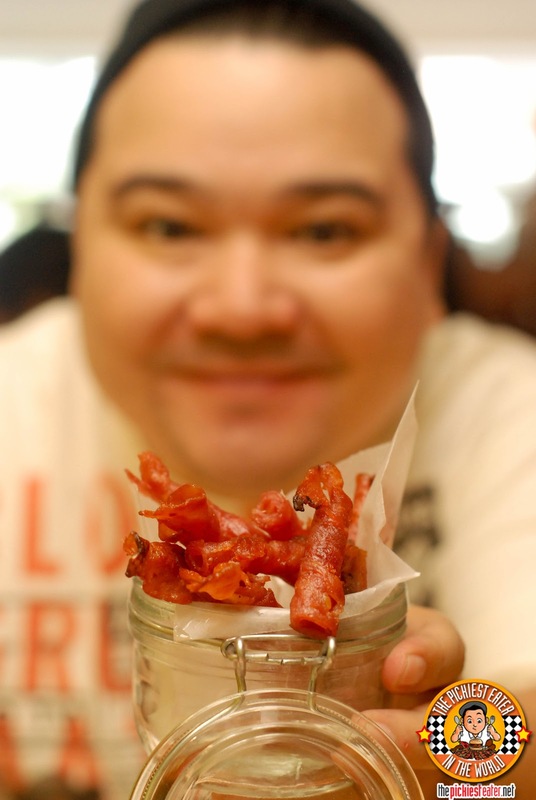 Adobo sunrise and bacon twist!!! I am big on breakfast so I'm excited to try the Early Bird Full English with some signature pancakes.. yum! the adobo sunrise and bacon twist yum yum yum..
Adobo Sunrise, too! It look so delicious! 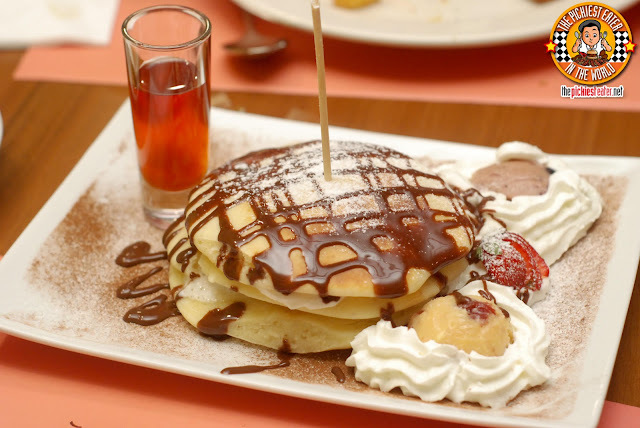 I want to try the nutella cheesecake and early bird signature PANCAKES! i wanna try The Early Bird Signature Pancakes ! The Early Bird Full English! Definitely! I want to try the Adobo Sunrise. It looks mouth-watering and it passed your good taste. 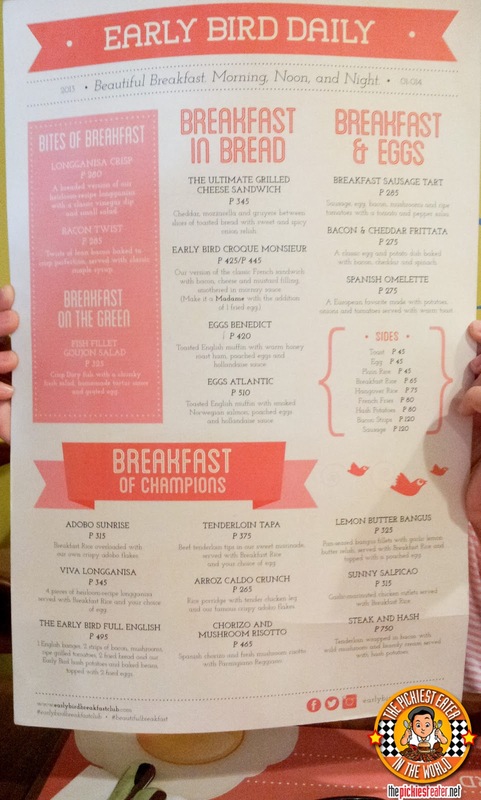 I am excited to try The Early Bird Full English & Adobo Sunrise! I'd like to try their French Toast Fondue dipped in cinnamon! Like Rina, I am also very fond of risotto so the chorizo and mushroom risotto will definitely be the first dish I'd try! A girl could try the Early Bird Full English right? Arroz caldo crunch seems interesting. And of course, Nutella cheesecake! All of them, but basically bacon, and mushroom risotto would be great. I wanna try the Bacon and Cheddar Frittata and their Nutella Cheesecake! I want to try the Early Bird Full English. The Early Bird Full English! 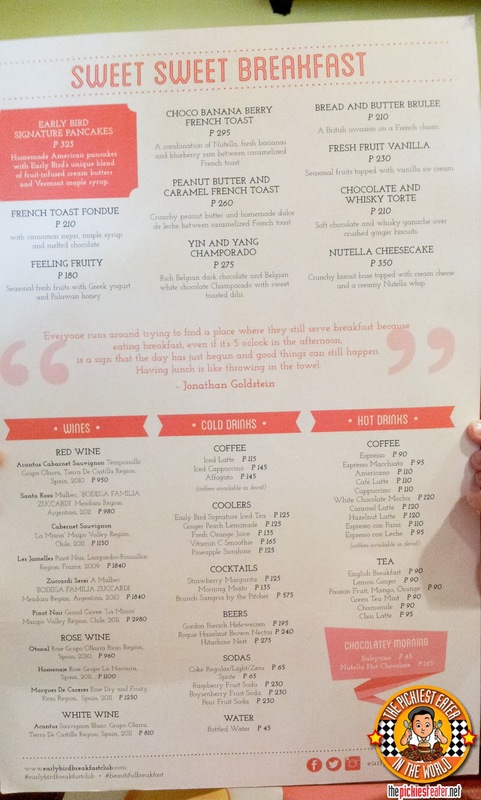 I wanna try the Adobo Sunrise and Viva Longganisa! I love your blog entries! They way you write just makes the food seem so much better! My gf and I also have a food blog, maybe you can visit and share some tips for us on how to drive traffic towards our blog better? Thanks, man! I want to try their Adobo Sunrise (flakes) and Tenderloin Tapa! Definitely! Most of their fare is very good... so one by one lang muna hehe. I really, really want to try the Early Bird's Peanut Butter and Caramel French Toast! A very, very, very good combination of my favorites! Those bacon twist and viva longganisa are to die for! This is really the breakfast of the champions! I cannot wait to eat here! Bacon Twist and Pancakes look awesome! Can't wait to try them! I would love to try your Chorizo and Mushroom Risotto version! This entree may seem simple to do, but it's really all in the burst of flavors. This will surely melt in my mouth. Yum! Bacon Twist and Pancakes looks delicious!! I'd like to try their Signature Pancakes! Early Bird Full English and Signature pancakes looks yummy! i want to try The Early Bird Signature Pancakes..looks yummy! I want the early bird signature pancakes! Wanna try early bird full english or signature pancakes.